So guys, this will likely be my last local PvP theme for some time, as summer work will be taking up most of my time. I have some ideas for an enjoyable PvP contest that would play to Star Trek fans, and isn't straight up PvP for those who don't particularly like PvP. I plan to construct two identical Starfleet-style starships facing each other over the ocean where the West rail to Arendelle used to run, with a pretty glass walkway heading up there. This will be done over the ocean to avoid land destruction from this match, for reasons you'll soon understand. Players will be assigned teams and have to go into one of the two ships. From there, they will have assignments, like captain, engineer, shield tech, etc. Depending on your assignment, you will be allowed to bring special equipment, like for instance, projectiles to launch or redstone/blocks to repair circuitry, and so on. 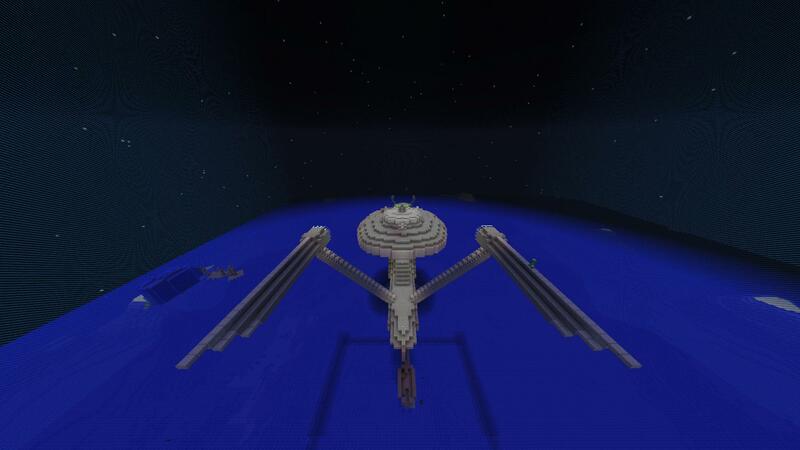 Every ship will have a TNT-filled warp core at the center of it. Your objective is to destroy the opposing ship in some way, either by breaching the enemy ship yourself, or by shooting a projectile that hits this area and destroys the ship. Every ship will be equipped with a slime-block-powered TNT launcher as a torpedo bay, and several dispensers that can be loaded with anything, from arrows, to fire charges, to snowballs and eggs. 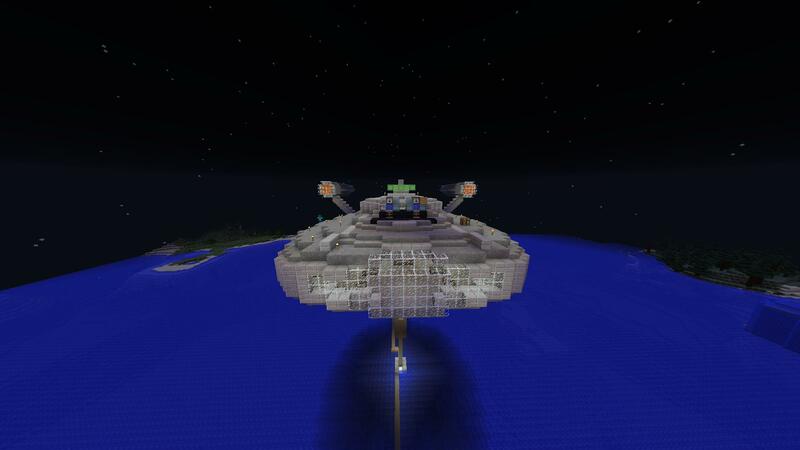 Both ships will have gridded shields, composed of pistons surrounded by a number of slime blocks. When activated by a switch on the bridge, a section of the "shield" will pop out, allowing you to deflect a fired TNT or any kind of projectile. If you time it correctly, you shouldn't take any damage. If you don't, part of your shield and part of your ship will be destroyed. I'll be running redstone back from each module of the ship to a status board on the bridge, labeled, so players can see what parts of their ship is damaged. I would also like to have a room where a player can go, step on a pressure plate, and be teleported to a room within the enemy ship, as a way of breaching that ship. The easiest way I would think to be able to do this is command block. Due to the fact that the idea of the match is to literally destroy each other, the area in which the event takes place will need to be reverted to its last good state in order to reuse the arena. A) for the teleporters, make a pipe with an invis pot at both ends, so you cannot see the players. You can also use enderstaisis chambers for teleportation. These mechanisms trap an ender pearl until a redstone signal is applied. 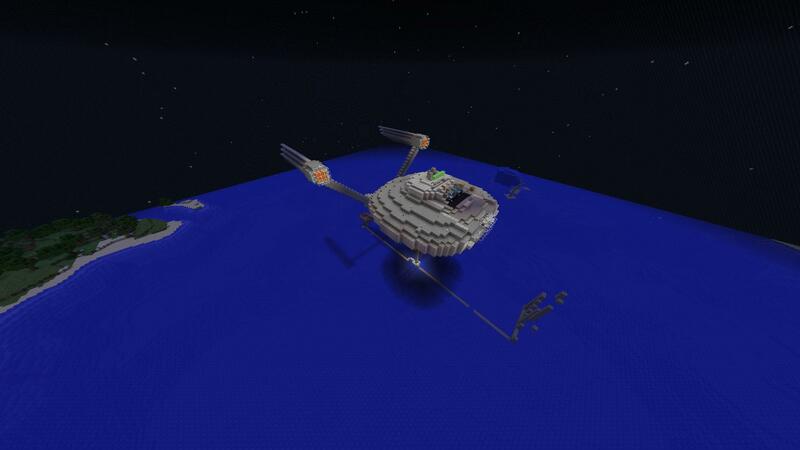 Each player would have to throw an enderpearl into the mechanism before each match, then a redstone line or a flying machine missile could act as a trigger. 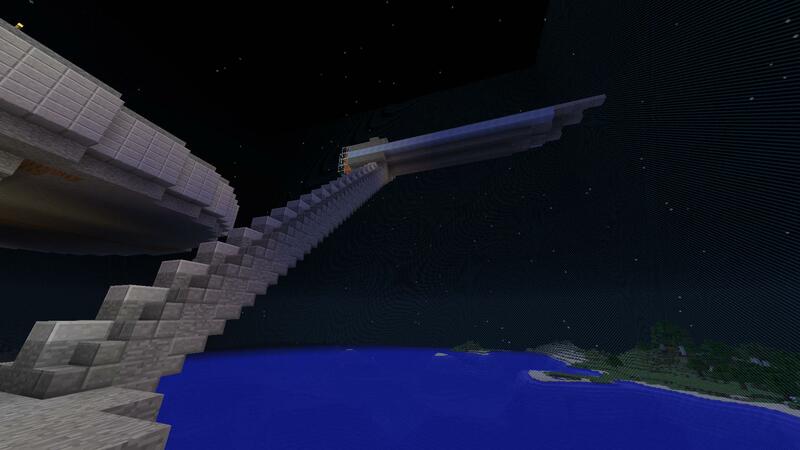 Flying machines aren't allowed on the server, and not sure how the redstone would work with that. Feel free to show me when you're on next. I don't have the materials to make multiple copies of the ships/arena. Or the money to buy the materials. Ask an admin to do a /clone of it and use that to "reload the map". This is done by using the original map, A, and cloning it to make B. B will be used, but another clone can be done (command blocks preferably) to make C, overwriting B, if that makes sense. I honestly think the best way to go about #2 is to create a separate world. You make the ships in the world then an admin can duplicate the world. Once the game is run, the world is deleted and a new duplicate from the master is created. This is the same tactic I use on the Mansion Raids. The teleports shouldn't be a problem. We'll likely have to manually set the portals each time we duplicate the world though. On some thought, I'd be down with this. How would we set up access? A portal? Where would said portal be located? Could we put a portal leading into each ship in the secondary world? How large would this world be? If I was going to keep it in the overworld, I would build smaller ships, but if it was in a separate world, I could make them a bit bigger and more intricate. I would think each ship would be about 70-ish blocks long, and 30-40 blocks wide, meaning the total playing area (both ships, and some space between them) would come to about 160 blocks across by 40 blocks wide. 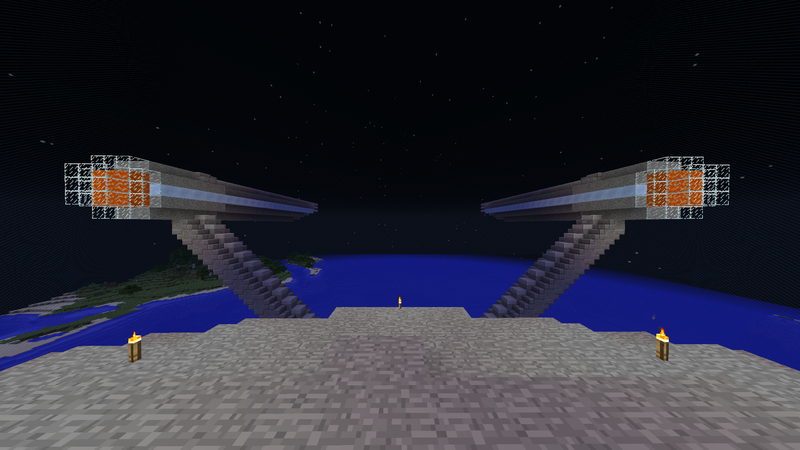 Well guys, the arena still has a lot left to go, but here's some screenshots of progress. @Alex: When the first ship is completed, is there any chance you can copy, rotate, and paste a copy back in facing the first one? 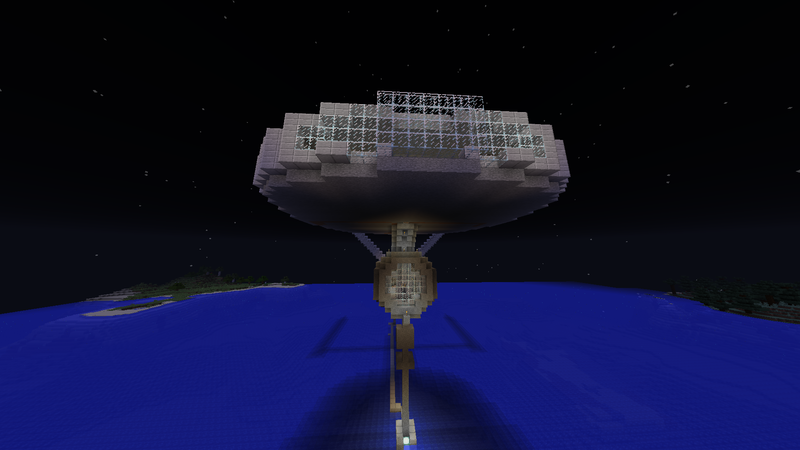 Special thanks to WhosAdam, Whos_Austin, Michael3_2B, Lord_Charlemagne, and others for much help putting this together. View of the almost-completed ship, from the outside. The viewport, used to see the opposing ship. View of the bridge, from the window. Captains chair, first officer chair, low-range torpedo triggers, and arrow bay trigger in shot. The trigger for the high-range torpedo bay. View of the left side of the warp core. Core packed with TNT, and end crystals to the side for a ship-annihilating explosion if the core is hit. 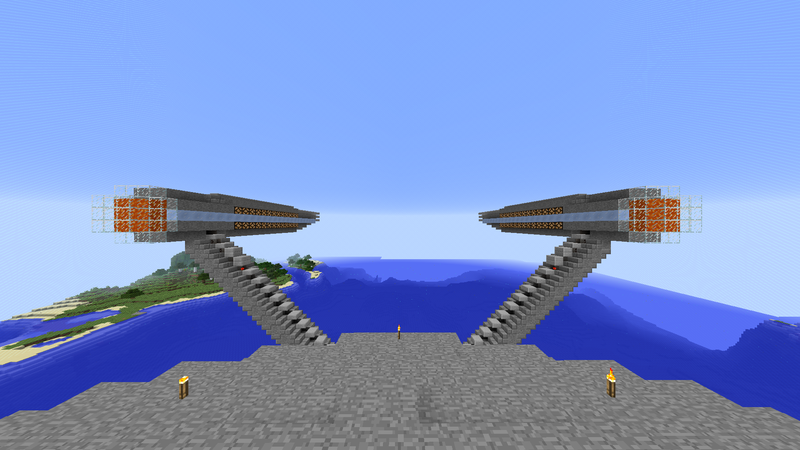 Top, then bottom, view of the redstone controlling the weapons system. One of the warp nacelles completed. Is there a tutorial for this/schematic? Consider replacing some stone with stone bricks every once and a while. It adds a bit of texture to the ship. This can help because you can do stone brick slabs and put glowstone under it so you don't have to do torches. You seem to have an exposed redstone block in the cockpit screenshot. Well, you don't really want to blow up something pretty, right?! I like it how it is, a good improvement would be to make it out of lapis ore or diamond blocks. Perhaps also add random, hidden TNT blocks throughout the ship, and even patches of lava! Maybe some leaks of water too! Not sure exactly what you're saying, but to my understanding the entire arena will be saved and can easily be reset/restored after every match. Also ACag, I can start working on the other warp nacelle if you'd like. I will write up a tutorial and a schematic of the ship. 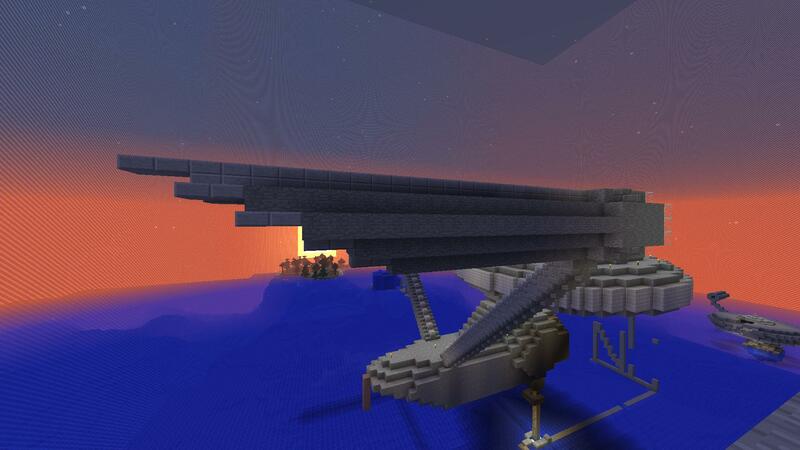 And will also offer players a chance to explore the ship and maybe test fire stuff once it's set up. And sure, go for it. What we do need to do is add in a few (2 or 3) more layers at the bottom of the saucer, each layer getting smaller. I thought the nacelles looked a bit stubby, so I added a bit of length and also a bit of contrast to them. If you don't like it or just want it reverted, I can always change it back (I know some people can be protective of their own stuff, so my apologies if I caused any trouble). Anyways, heres a few pictures I took. I snapped a few after I added a bit of length to the ends of the nacelles and then some more when I added the packed ice. 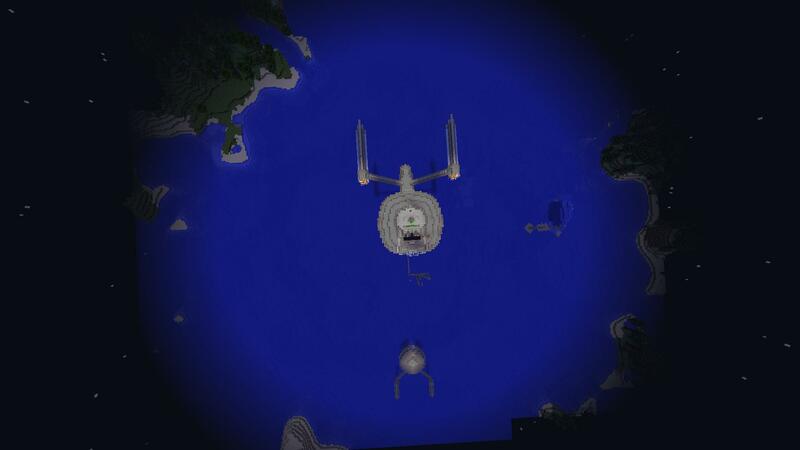 Edit: We added some lights to the warp nacelles as well, which can be turned on and off from the bridge. So a short to do list and one feature request. - A dropper may be filled with redstone. - The amount that the dropper is filled becomes the % chance that the "shields" will deflect a TNT. - When a TNT is fired at a ship, the % chance is checked and we decide whether to deflect or not. - If we decide to deflect, the TNT is deleted or its direction changed, and the contents of the dropper is reduced by a set amount, thus reducing the % chance of deflection. - Players may fill the dropper with redstone to keep the shields operational, but as they run out of redstone, shields eventually collapse. *** Maybe 2: If possible, can we have the shield strength, in % displayed somewhere, like in chat, modifying a sign, or via a redstone lamp indicator, or something. 1. Delete obsidian wall between ships. 2. Save and copy both ships. 3. If able, implement above shield system (and test). 4. Possibly create a button that can reset map. It seems like an End world would be more fitting for this event, as the sky displays stars constantly. If you were to make an End world for this, you could copy the region folder between the worlds or use WorldEdit schematics. You could also replace the water with end portals, and add a portal just above them that sends you back to the starting platform so they are never actually interacted with. Wall can be taken care of easily. I have some obsidian blocks positioned so I can quickly copy the bounding area. These bedrock blocks will also make it easy to retrieve the coords of the ships OUTSIDE the border so a command block can be set up to copy and paste them. We just need to find a place to put it. I also still need to check if SaveInventory is a world specific condition. Bad idea. It's already been done and oh man it was a bad idea. FPS drop was significant for all players. Not TPS, FPS. Also, it crashed the server 3 times before I was able to undo it (mostly the act of undoing it crashed the server). Yeah so, bad idea. Awesome. One thing I'm working on and cant quite figure out is a combination lock for the warp core chamber, so it can be accessed. Someone better with redstone than me who can fit a simple lock in the available space feel free to try their hand. Alternatively, I dont need to install one and I'll leave an access route to the warp core, perhaps from the bridge. @command/Alex, the simplest thing to do is just remove the ground under the ships, you get blown off and fall out of the world. 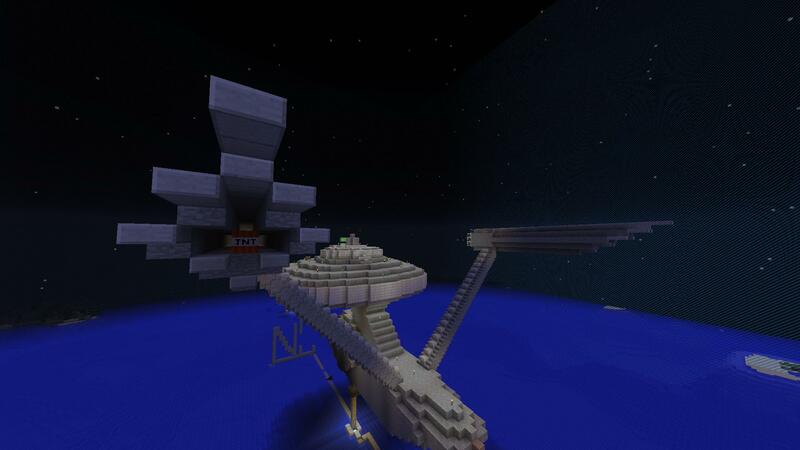 Or alternatively, we can build an observation area, place a portal under the ships, if you fall into it, you get teleported to the observation area. @Alex: What do you think of my shield idea? Is it doable? © Copyright 2000-2019 Cemetech & Christopher Mitchell :: Page Execution Time: 0.128271 seconds.